How Can You Pack More in a Small Moving Box? As opposed to buying an unknown amount of feet of bubble wrap or various packing peanuts, the padding that you desire can easily be gotten from some of your old clothes. Apart from the fact that it saves you a lot of money, but it is advantageous as you will most probably have to get those packed anyways. You’ll be literally killing two birds with one stone, plus clothes are usually much more malleable than packing peanuts and bubble wrap. If you have stuff like glassware, you can wrap it in a clean and properly washed sock. This way, even if the socks clink against each other, your glassware will be unharmed. Make sure that you keep every item wrapped with sufficient layers of wrapping sheet, or clothes. 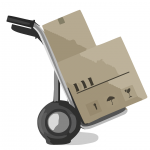 Make sure that these items are carefully placed in a moving box in order to avoid any damage. Place heavier items at the bottom and lighter ones at the top of the boxes. Also, make sure to get as many items inside one box as possible so as to reduce the number of boxes you’ll end up using. Heavy items such as books, toys, etc. can be picked in small boxes. However, you also need to ensure that you don’t over-pack the boxes to the point where they become excessively bulk as their contents might get damaged or cramped together. If you have breakable and fragile items (and you’ll most probably do), make sure to pack them with extra care. If you need to, you can use more layers of clothes to ensure that such items are safe. You can place some saran wrap between bottles and caps in order to avoid any leaking. You can also choose to put some cotton in between delicate cosmetics as well. If you have any excessive space in your boxes, you can fill them up with newspapers or crushed papers. You can put all your hardware in thick Ziploc bags, and arrange them according to their content and how much room you’re afforded. All of these Ziploc bags can be put in a single box with all the proper tools. This way, you’ll find it easier to put them all back as soon as you’ve moved into your new home. You can keep the hardware box in a central place where you can easily find it as well. You sure don’t want to forget it.